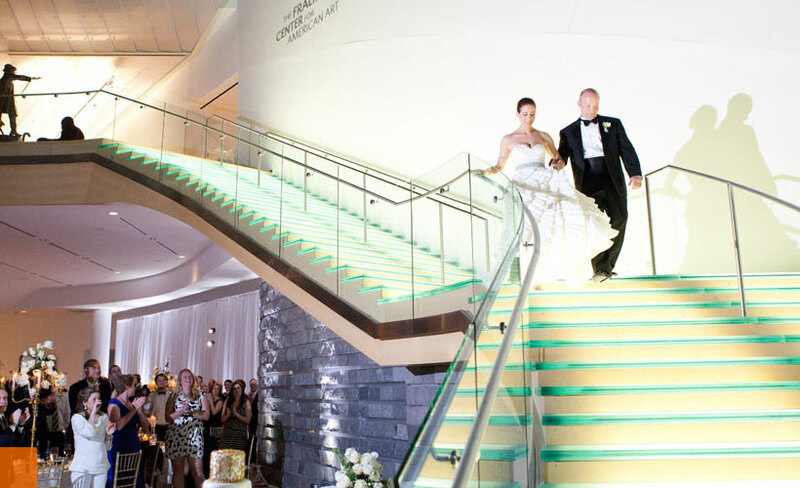 With five beautiful indoor spaces featuring varying capacities, amenities and atmospheres, the Taubman Museum of Art is a versatile venue perfect for an array of special events. City of Roanoke Atrium: boasts a soaring glass roof and spectacular glass staircase. This venue is open, with ample space for seated dinners to cocktail receptions. It accommodates 150 seated and 250 standing, and can be used in conjunction with the auditorium for additional capacity. Advance Auto Parts Auditorium: can be set-up for lecture-style events, arranged for a seated dinner or organized for a standing reception. It offers a stage and free Wi-Fi and accommodates 125 seated and 175 standing. Board Room/Lobby/Balcony: comes with state-of-the-art audio-visual equipment, Wi-Fi and videoconferencing. 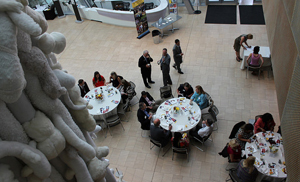 The board room accommodates 50 seated and 100 standing. Norah’s Café & Patio: is available for rental outside of normal operating hours. The massive windows offer guests dramatic views of the entire museum and the Blue Ridge Mountains. The café can accommodate 60 seated and 100 standing. Black Box Theater & Lobby: offers a large stage for lectures, movies or live events. The space features 144 lecture-style stadium seats not unlike the comfortable seats found in a movie theater. This rental also includes the use of the theater lobby and private restrooms. We at Blue Ridge Catering are proud to partner with this uniquely exquisite venue. 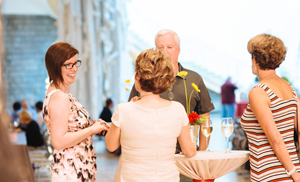 Its contemporary look, variety of rental space options and overall trendiness are what attracts people to this location, and we are excited to have formed a partnership with this museum to help bring your special event to life.